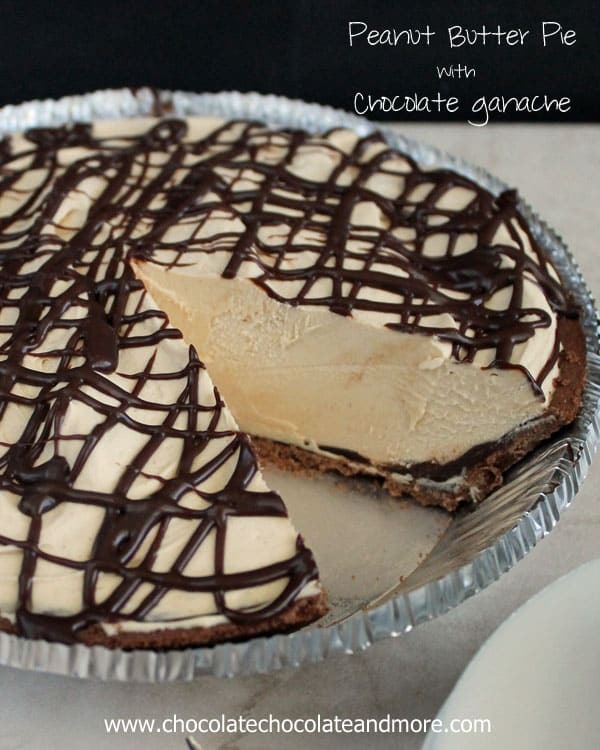 Peanut Butter Pie with Chocolate Ganache - Chocolate Chocolate and More! 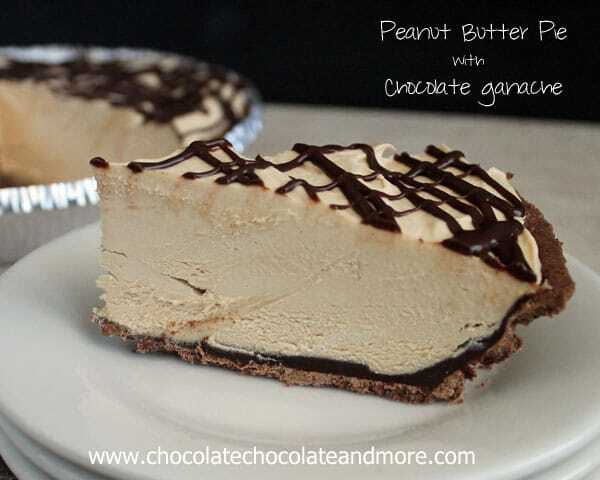 Peanut Butter Pie with Chocolate Ganache-creamy peanut butter filling with chocolate ganache on top and on the bottom! We need to talk about store bought pie crusts. Specifically the graham cracker crusts. I’m all for making crusts from scratch but I don’t always have time. Or patience. When it comes to pie, I’m in it for the filling, not the crust anyways. The crust is just the holder for all the yummy on the inside. Here’s the thing about ready made crusts. It’s almost impossible to find one still completely whole in the stores. There’s always a crack or a chip on the crust. Or several cracks. I’ll dig all the way to the back, unstacking 10-15 crusts trying to find one still whole and unblemished. And when you do find that one perfect crust, you still have to get it home in one piece. The baggers at the stores, they know about your eggs and not mushing your bread. But they just don’t realize how delicate that crust is. Or worse, in your own effort to carry in all 12 bags of groceries in just one trip, you forget about your perfect crust. You wedge it between the bag with the milk and the bag with the canned goods. No, a perfect crust is hard to find and keep. 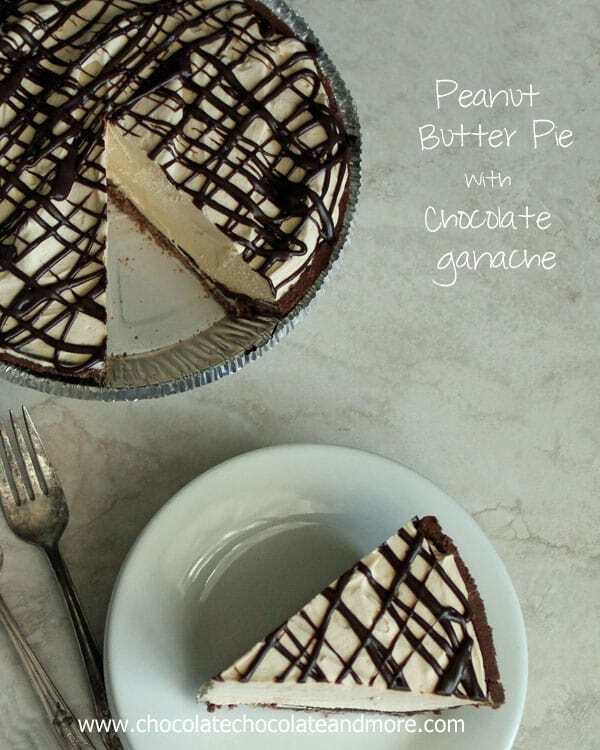 The greatest thing about this pie, besides how amazing it tastes (we are talking about peanut butter and chocolate here) is that it doesn’t need a perfect crust. The chocolate ganache below the filling acts as a sealer for the crust. Binding all those cracks back together, filling in any chips. Making your pie crust perfect again. Prepare the filling. Cream together peanut butter and cream cheese until smooth and well blended. Add in powdered sugar and mix on low. Add in Cool Whip and beat on medium until fluffy, scraping down sides of bowl as needed. Set filling aside. Make your ganache. Using 2 cup, microwave safe bowl, microwave chocolate chips and cream together on high for about 1 minute. 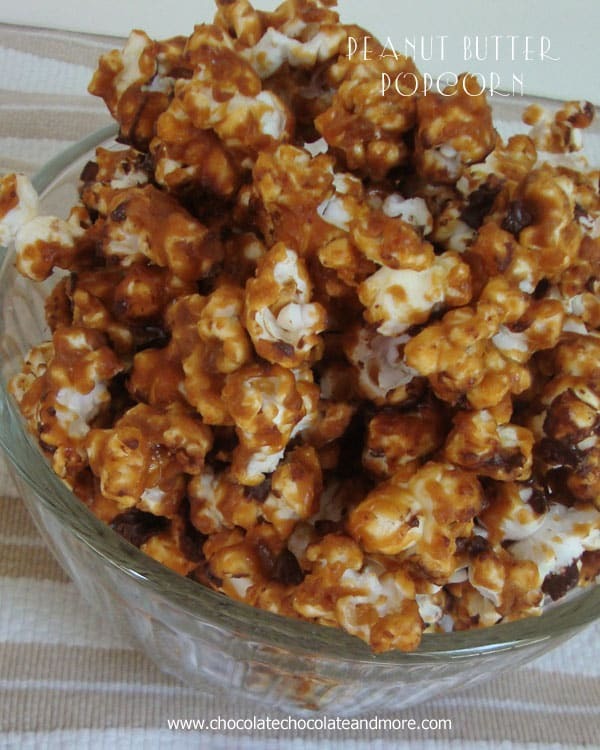 Remove from microwave and stir until chips are completely melted and chocolate is smooth. If necessary, microwave for another 10 seconds. Let cool for about 5 minutes. Using the back of a spoon, spread all but 3-4 tablespoons of the ganache over the inside of the ready made crust, making sure to go up the sides. Let crust sit for about 5 minutes for ganache to set up. Add peanut butter filling and spread evenly to fill the crust. Drizzle remaining ganache over top of pie. Refrigerate pie for at least 2 hours before serving. This pie can also be frozen. Let pie thaw for at least 2 hours before serving. 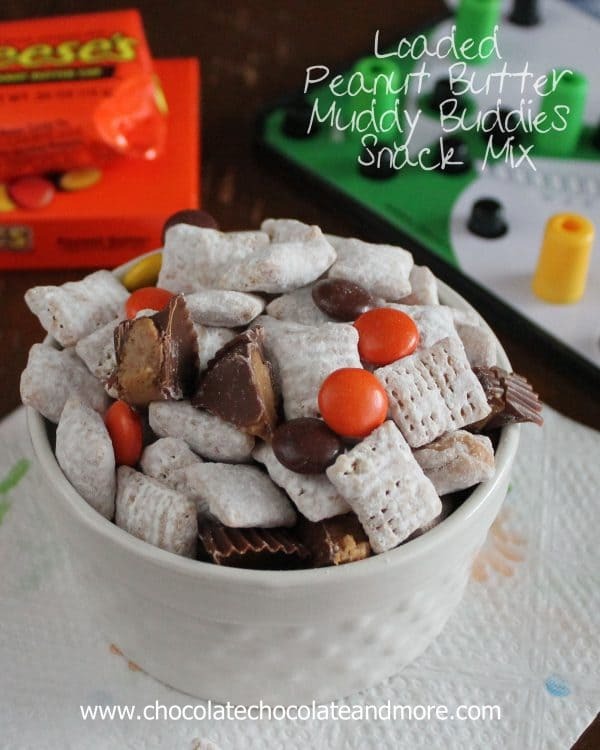 Want more peanut butter treats? Cool Whip is a sweetened dairy free whip cream substitute. You can use whipping cream/heavy cream but you would have to sweeten it and whip it really stiff. Also, whip cream melts, cool whip doesn’t, so the consistency isn’t quite the same after a period of time. Love!! 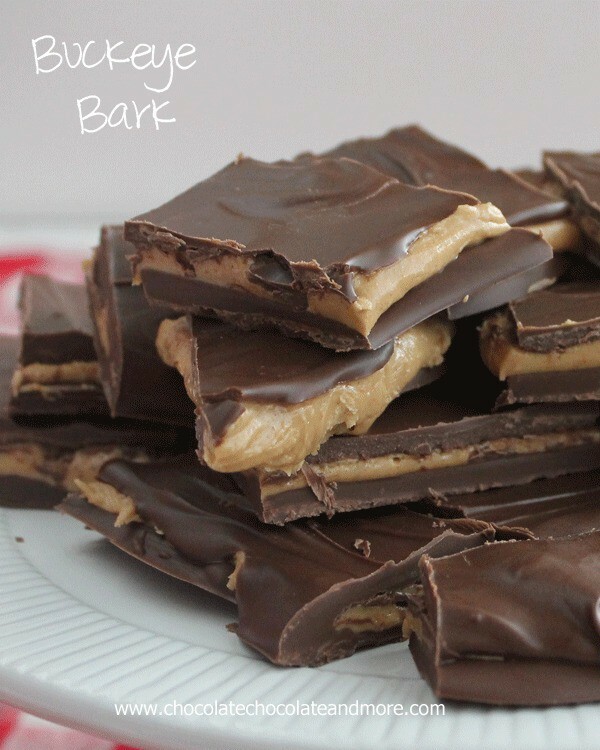 You can’t go wrong with chocolate and peanut butter! 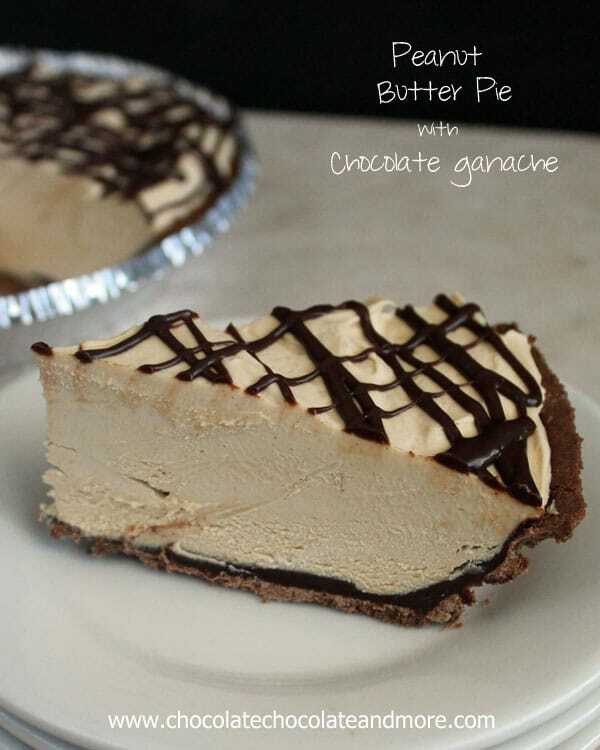 I have a similar recipe and the pie is always a hit! 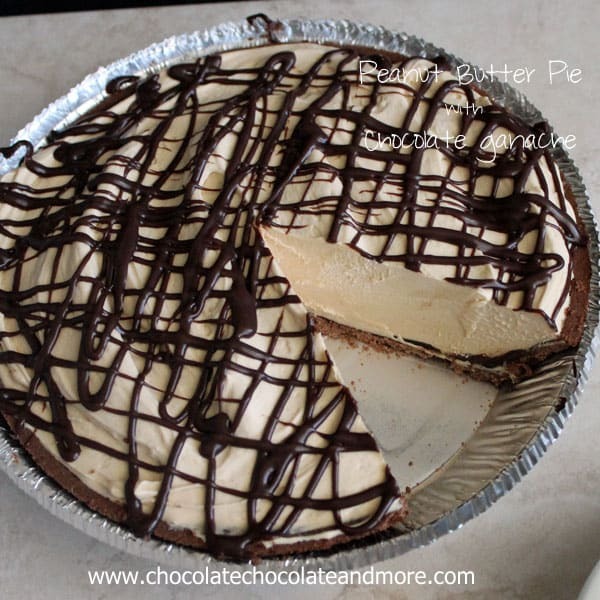 I like the chocolate pie crust and will try that next time. Yeah, chocolate ganache is ALWAYS a good addition!!!! 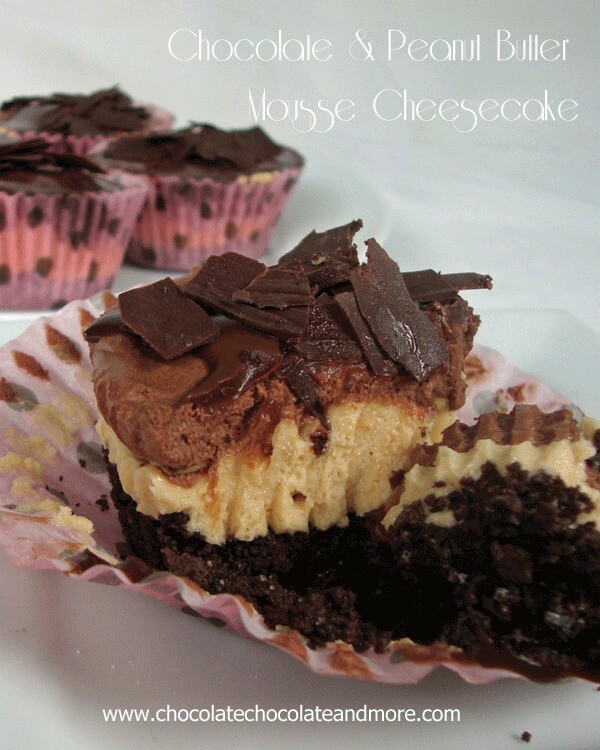 Love graham cracker crust and the ganache and that AMAZINGGG peanut butter filling! So luscious! Joan what a great idea to seal those cracks!! I once had to throw out a premade crust because it was all broken with holes and ended up making one from scratch which defeated the whole point. Aieee! But I’m so glad this pie is inspired from such inspiration!! It’s glorious! 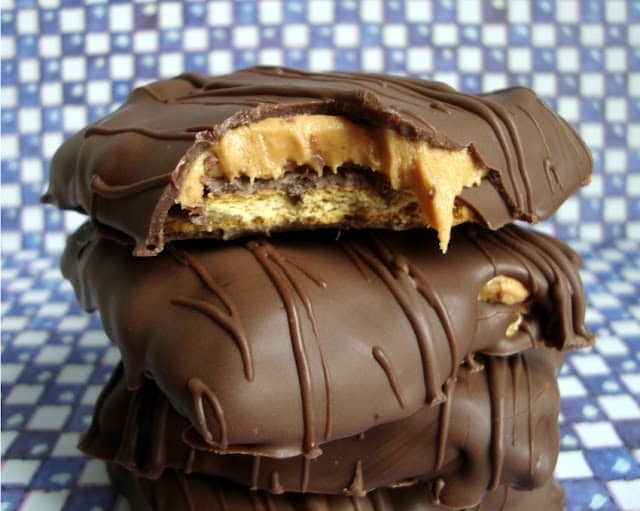 Oh, yeah, chocolate and peanut butter ranks at the top of my “goes together” list! Pinning! Do you think I could sub in sunbutter? I have a peanut allergy in the house. Just made this for a dear friend of mine who is a peanut butter fanatic. I’m not that big on peanut butter, but the filling is delicious! Can’t wait for her to come pick it up and let me know what she thinks! 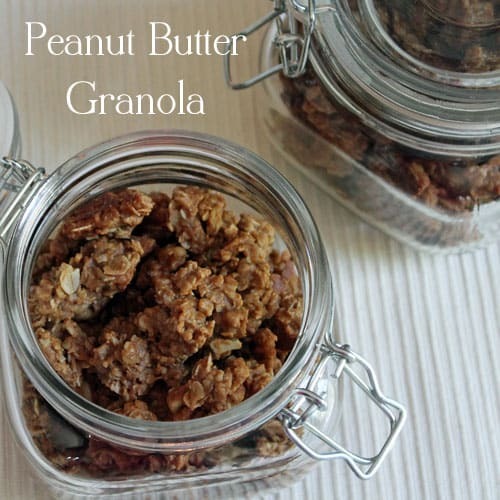 Thanks for another ‘go to’ recipe to add to my repertoire! 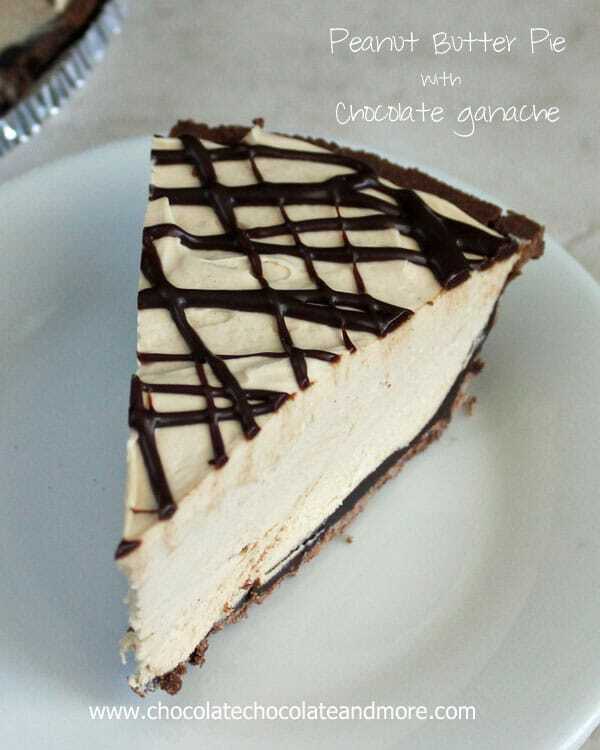 Just discovered your blog from Yumgoggle and I have to say that this is a tasty looking pie. You’re so right about those store-bought graham cracker pie crusts. No matter how hard you look, there is always going to be a pie crust that is cracked. Thanks Neeli! I hope you enjoy the pie!